Paint your town pink during your next breast cancer awareness walk when you and your team rock these pink ribbon Breast Cancer Shirts. This unique and creative take on the breast cancer pink ribbon will let others know that you are supportive of the fight for a cure! Wearing this Breast Cancer Awareness Shirt is one of the best ways to show your support in finding a cure. This great design is printed on our premium 100% cotton, preshrunk long sleeve shirt, machine washable in youth sizes S-L and adult sizes S-2XL. 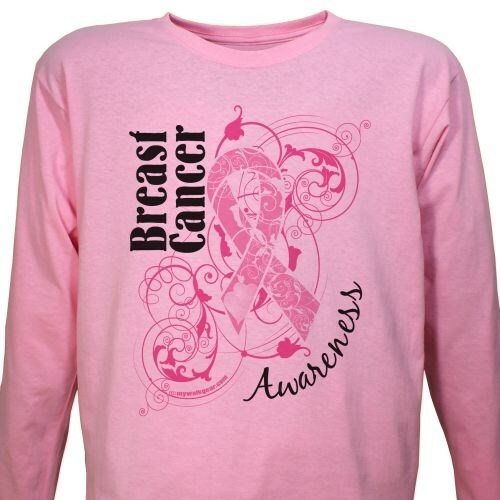 Additional Info This breast cancer awareness shirt will definitely turn heads at your next walk! Get one for each member of your walk team and show family, friends, and your community that you want to take action and help find a cure for breast cancer. Our Breast Cancer Awareness T-Shirt is great for when the weather gets warmer.